Welfare is commonly conceptualized in socio-economic terms of equity, highlighting distributive issues within growing economies. While GDP, income growth and rising material standards of living are normally not questioned as priorities in welfare theories and policy making, there is growing evidence that Western welfare standards are not generalizable to the rest of the planet if environmental concerns, such as resource depletion or climate change, are considered. Sustainability and the Political Economy of Welfare raises the issue of what is required to make welfare societies ecologically sustainable. Consisting of three parts, this book regards the current financial, economic and political crisis in welfare state institutions and addresses methodological, theoretical and wider conceptual issues in integrating sustainability. Furthermore, this text is concerned with the main institutional obstacles to the achievement of sustainable welfare and wellbeing, and how these may feasibly be overcome. How can researchers assist policymakers in promoting synergy between economic, social and environmental policies conducive to globally sustainable welfare systems? Co-authored by a variety of cross-disciplinary contributors, a diversity of research perspectives and methods is reflected in a unique mixture of conceptual chapters, historical analysis of different societal sectors, and case studies of several EU countries, China and the US. 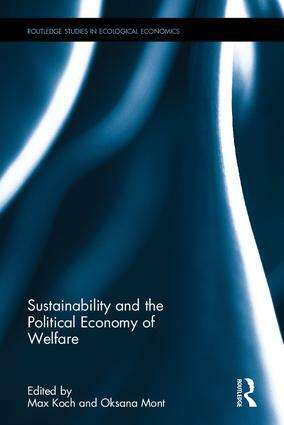 This book is well suited for those who are interested in and study welfare, ecological economics and political economy. Max Koch is a Professor in Social Policy at Lund University, Sweden. Oksana Mont is a Professor in Sustainable Consumption and Production at Lund University, Sweden.